"Don't take my picture!!" said Abdullah Noor when I bumped onto him just now outside the Jalan Besar Stadium. But when he saw the priceless poster, he was surprised and asked how and where I got it. Having told him the story, he duly signed the 1990's poster with admiration from his students. 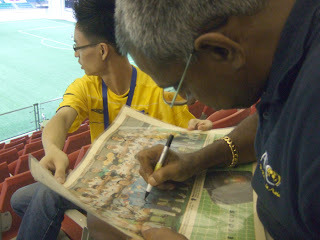 "Can make ONE copy for me or not" said the former Balestier Khalsa, ex-Sengkang Marine coach before parting off. Some way to go before more legends get their hand onto it but can be done. Yup... sure long way to go, to think Abdullah Noor being the first signatory in year 2009! !